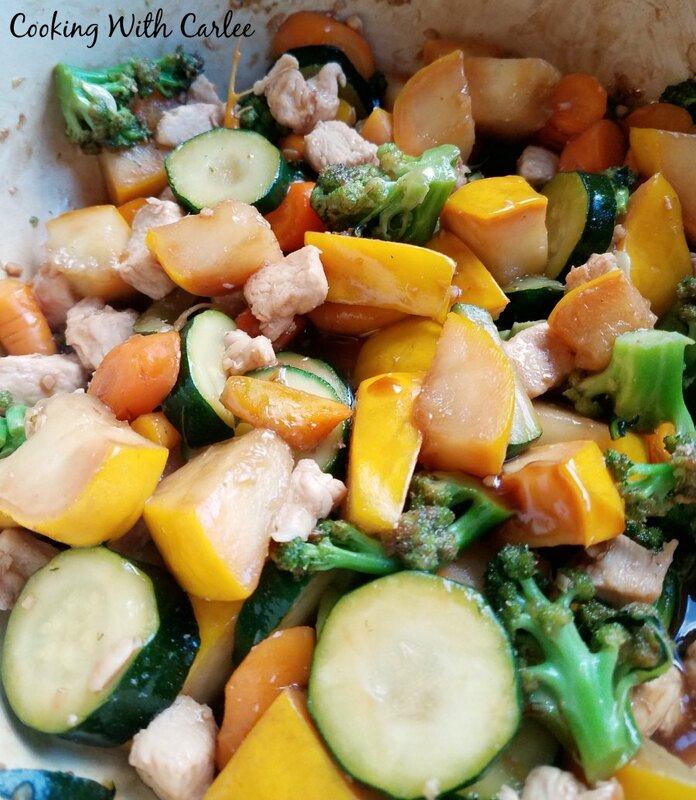 Summer vegetables and chicken are quickly cooked until tender crisp and then coated in a delicious stir fry sauce. Dinner is ready by the time the rice is done cooking! You'd think with all of these zucchini recipes, that I had a huge garden full of them. In fact, we haven't planted them in at least 5 years. Don't get me wrong, we love them. When we moved to this house we went from a large garden in the backyard to just using the raised beds that were here when be bought the place. We had to cut down on what we were going to plant and while we enjoy growing and eating zucchini, they take up a lot of space. So we opted for more plants that grow vertically and greatly reduced the number of plants. In the last couple of years we have been tearing out those old raised beds and built beds closer to the house. They are even smaller yet, but seem to be just about right for our current schedules. Each year we tend to get a little bit better about choosing what and how many to plant. This is by far our most judicious year as far as number of plants, but we still have plenty of produce. Our strawberries are always the first thing to come in. This will be the last year for that patch. The boys were busy building a new patch and tearing out the old one. So we will likely miss a harvest next year but will hopefully be back in the swing of things the following year. After that our giant blackberries start ripening. This year we enjoyed some blackberry ice cream, blackberry crisp and plenty of blackberry smoothies. We also have a couple of gallons of berries in the freezer to be made into blackberry pies or other fun desserts this winter. This year we only planted 3 tomato plants. Usually we squeeze to many in and they stifle one another, so this year we thought we'd really limit what we planted and see how it went. Well it went BIG! Our three little plants filled more than half of a 4'x6' bed. They grew over seven feet tall before my husband trimmed off the tops. We know from experience that those top branches will only bend and break once they start producing fruit, so we didn't want the plants to waste too much more energy growing up there. Those three plants are each in the largest cages we can find, plus there are auxiliary cages around them to help support them. Then there is some wire mesh that is usually used for concrete suspended on poles around it all to give them even more support. We've lost some huge plants right as the fruit was beginning to come on in wind storms before and my husband was bound and determined to get those fresh off the vine slices of tomato on his sandwiches this year. So we basically have the Fort Knox of tomato gardens. Luckily as you have heard a lot lately, my brother has a HUGE garden planted this year. Even luckier yet he lives across the street, so it is easy for extra produce to find its way to our house. So armed with plenty of squash, homegrown broccoli and carrots, it seemed like a stir fry was in order. Of course if you don't have such easy access to all of this fresh produce, you can certainly find plenty at your local farmer's market. There is just something about knowing your food is that fresh and local that makes it even more special! The fun thing about making a stir fry is how customizable they are. If you don't want to use chicken, you can always sub in beef, pork or just leave it all vegetables. If you don't like mushrooms, leave them out. If you like it spicy, make it spicy! We like a mild stir fry and my husband and I add sriracha if we are feeling spicy. That way little dude will eat it without complaint. His pallet is still a little sensitive to spice and he doesn't enjoy the burn like his dad does! All of this fresh produce talk has me wondering what all you guys grow in your gardens or what your favorite farmers' market finds are. Tell me all about it! 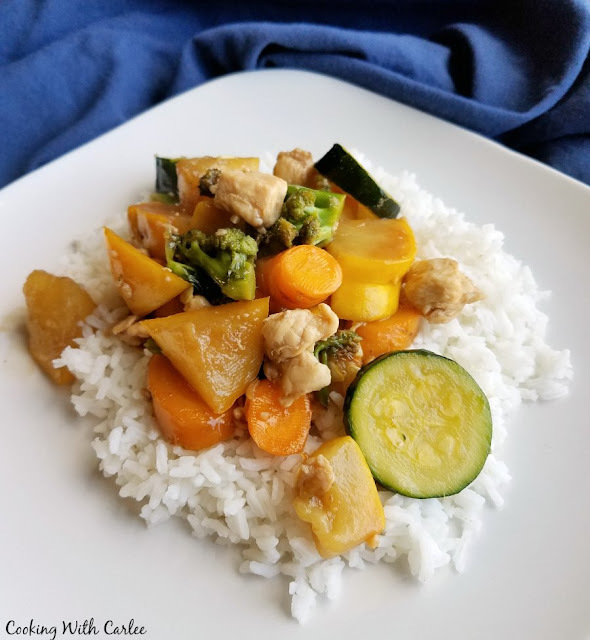 Summer vegetables and chicken are quickly cooked until tender crisp and then coated in a delicious stir fry sauce. This quick and easy dinner is ready by the time the rice is done cooking! In a small saucepan, whisk together the sauce ingredients. Cook sauce over medium-low heat stirring frequently until it thickens to about honey consistency. Remove from heat and set aside. Chop vegetables into large bit sized pieces. Cube chicken into just shy of one inch cubes. In a wok or large pan, heat the oil over medium to medium-high heat. Add the chicken, stirring every so often until browned on all sides. Add the carrots and continue to stir and cook for a 2-3 more minutes. Add the broccoli and squash and continue to cook and stir until the vegetables are all cooked to your liking and the chicken is cooked through. Spoon all of the sauce over the chicken and vegetables. It may not seem like enough at first, but it will draw out some liquid from the vegetables. Cook and stir until coated. What a great recipe to use your fresh garden vegetables or seasonal vegetable available at the farmers market. Thank you! I like to try to vary the flavors a bit if we are going to be eating the same produce over and over. I used to make tons of stir fry and got away from it. Need to add this to my menu, STAT! It's funny how we go through phases like that, isn't it? 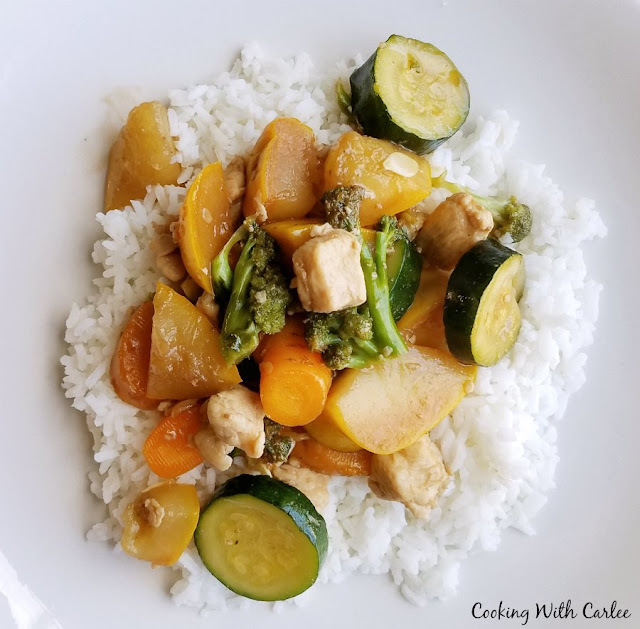 Your Vegetable and Chicken Stir Fry looks delicious! Thanks so much for sharing your post with us at Full Plate Thursday and have a great weekend! So much better than take out! Your garden sounds fabulous! Wish I was your neighbor for any extras! You should definitely move closer! Hi Carlee, I do like a good stir fry, but it's something I'm not very good at. Other peoples always taste better! I've tried different oils and frying less at one time, with little difference. I do keep trying though. Your tomato plants sound huge! I was loving mine until the heat got the better of them. And next year I will plant more zucchini plants and less peppers. Living and learning! My husband cut the tops off the tomato plants for fear they'd just break under the weight of a big tomato anyway. But he measured them first and they were 9 feet tall! Of course we train them to grow up though. I wish I would have gotten before and after pictures of their trim! It is definitely great for all seasons! It's just a lot easier to make it for very little cost when you can harvest most of it in your own backyard ;-) I do like stir fries in the fall too though. Another yummy recipe! So glad you share with us at Merry Monday Carlee. I'm Featuring this recipe among my Features this week! Pinned and scheduled to share on my FB. Thank you so much, Shirley! Have a great week!